Imagine having to do a reboot of a movie franchise that one of the greatest directors alive has already done so well. I mean, what could horror guy Neil Marshall do what Academy Award winner Guillermo Del Toro didn’t? Those first two Hellboys are brilliant. 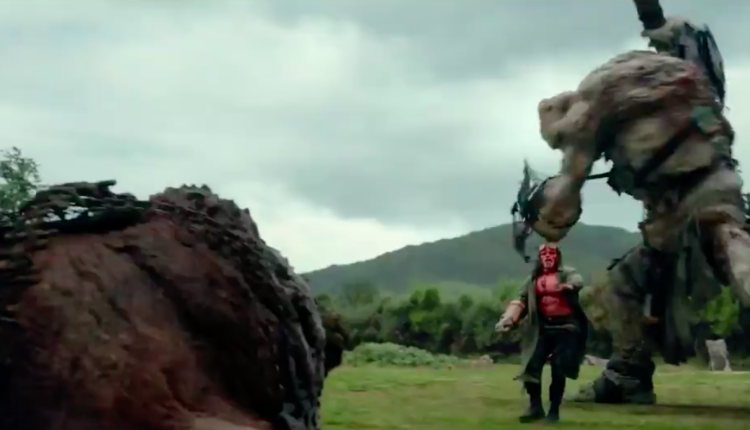 Still, the trailer certainly promises something that won’t be a disaster potentially, in a new adaptation of the beloved Mike Mignola comic book series. David K. Harbour replaces Ron Perlman, a robust Ian McShane replaces John Hurt as Hellboy’s father figured turned employer Bruttenholm, and apparently Thomas Haden Church is in this as Lobster Johnson if IMDB is to be believed. The trailer already shows us what this movie will give us that the first two Del Toro ones did not. The first is violence. That’s right, when a franchise is stuck as to what to do, they either go more “realistic” (Superman isn’t real anyway, WB, chill) or they go more violent, and this Hellboy films pours on the violence when we see a man’s head get shot so hard it explodes. One element this movie gives us that the others did not is an exploration of Mike Mignola’s more breathtaking creatures from the comics. The ones who lives in the forest. We see ancient fairies, massive trolls and more that come at the quieter element of Mignola’s comics, as Guillermo Del Toro explored the more bombastic, Kirby/Lovecraft inspired creatures. The biggest change however seems to be that Hellboy is brand new to the BPRD, the Bureau of Paranormal Research and Development that our hero fights monsters for. In the comics and Del Toro movies, Hellboy has been with the BPRD since at least World War 2. Here, in following the classic Syd Field, three act structure style, he’s a new employee even as the audience already knows so much about this organization. Yeah, I don’t know. I think you should have let the Academy Award Winning Director finish a superhero trilogy during the superhero boom. But hey. I’m no exec who decided to go with this.